The United States’ first National Dance Day, which was started by Nigel Lythgoe of SYTYCD fame as a grass roots movement, took place this past weekend, and was recognized by an official act of Congress! Congresswoman Eleanor Holmes Norton (D-DC), a long-time proponent of healthy lifestyles, introduced a National Dance Day resolution at a press conference on Saturday, July 31st, 2010 in Washington, D.C. In January, Congresswoman Norton introduced the Lifelong Improvements in Food and Exercise (LIFE) Act to promote exercise and diet changes. Norton’s LIFE bill directs the Centers for Disease Control and Prevention to be a lead agency in combating obesity and sedentary lifestyles. I think it’s wonderful that dance is now seeing such a resurgence in popularity! With TV shows like SYTYCD, and Dancing with the Stars bringing dance more into the mainstream, and having paved the way for the recent surge of dance-centric movies (like Mao’s Last Dancer) and the new Hulu web-series ”The LXD,” dance is finally getting the public appreciation that it deserves here in the United States. Dancers have historically been underpaid, and as a profession, dance has been under-appreciated, with many parents not considering it as a viable career path for their children, and few public schools offering dance classes. Hopefully with this new level of popular recognition and appreciation, the propensity to see dance as a starving-artist profession will wither away, and people like myself who have an innate passion for dance will be more likely to be encouraged to pursue it with all our hearts rather than told to find a more “sensible” (read: profitable) profession! 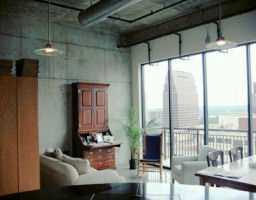 I posted some ideas and research not too long ago about how to create a Dance Studio Apartment. I’ve recently been doing a lot more reading and research on that subject (including real-estate hunting and tax-implications), and I am hoping to be able to actually pursue that dream and create my own studio in the near future (lots more info to come on that)! Tonight, while reading some Dance Magazine articles, I came across this one, about Secrets of a Successful Studio. Inside, many of the topics I discussed in my blog post are looked at from different perspectives, and with additional information. Other topics which I have been giving a lot of thought to recently are also discussed – such as ways to provide access to healthy food and drinks inside a dance studio (this is an area where I feel that many studios are lacking, with some not even providing convenient access to drinking water). 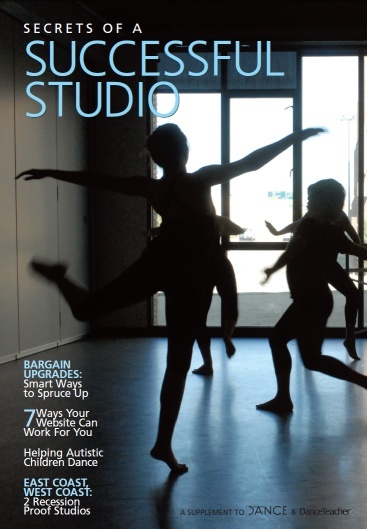 There are dance-related ads every few pages, but they are easy enough to scroll past – if you’re pondering the idea of starting your own studio, then you’re sure to find enough neat ideas in here to make the read worthwhile. I made a sort of last minute decision to go compete at Manhattan, and gosh am I glad that I did! It’s late at night, and I’m exhausted, so I’ll have to save the verbose story telling for another post, but suffice to say that I feel that I learned a lot from the experience of competing there, and I had the pleasure of dancing in front of and exchanging smiles with some very accomplished judges! I also had a great time with my friends from the studio, and I made some new friends there at the competition! And last but certainly not least, watching the Open Professional Standard was an absolute delight! Three of the top 5 couples in the world were competing inches from where I was sitting at the edge of the dance floor, and a few of their dresses even brushed against my face as they passed by during the quickstep! Talk about butterflies!!! P.S. I don’t know why the company that took the photos decided to have their watermark say “PROOF”… I think their company name would have been much better! Want your hair to look like this? Talk to Danielle Mayzes! Before my performance last night, Danielle Mayzes created this masterpiece atop my head…… in about 20 minutes! 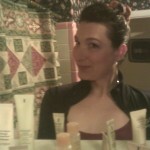 When I finally saw it in the mirror, I was floored! What’s more, I think she worked her wonders on two or three other dancers within about an hour! 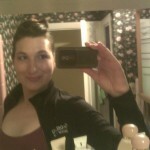 Thanks again Danielle – as in your dancing, you’re an artist in your hairstyling! A dancer friend of mine had an extra ticket available to the 7th Annual Boston Tango Festival‘s “Celebrate Tango” show tonight, and I’m very glad I went! All together, there were five of us, four dancers, and one hopefully soon-to-be-convert! The annual festival celebrates Argentine Tango, which, for the uninitiated, is very different from International Standard Ballroom Tango (the form of tango that I compete in and perform). Argentine Tango is a very beautiful and magnificent form, with deep cultural underpinnings, and a strong connection to musicality and improvisation. I have had lots of fun dancing little bits of it at social dances in the past, and while I haven’t yet invested the time to learn it, it is something I foresee myself enjoying more and more in the future! The show was really quite something to watch! Guillermo & Fernanda‘s first performance nearly brought me to tears – it was like watching a terribly sad movie, only they didn’t need to speak any words – their dancing, their emotions, their facial expressions, their body language – sent tingles down my spine and through my fingertips. It is always marvelous to be moved in such a way when sitting in an audience watching beautiful, emotional dancing. And tonight, it felt particularly special, because just last night, I myself was on a dance floor, in front of an audience, dancing and hoping to make a few people feel something special inside. There’s something magical about the cycle of performing and watching other people perform… it’s so inspirational! I can’t wait to perform again! What if I could have my own dance studio apartment? I’ve had this idea before – but last night I had a very vivid dream that kick-started my imagination again. I started by doing google searches for apartments with sprung floors, with very little luck – the only one I found was an expensive hotel in Prauge! Next, I started searching for portable sprung floors – like the kinds that they assemble in hotels for week-long dance competitions. After a few false starts, I stumbled upon the O’Mara Sprung Floors website. They sell portable sprung floors in many different configurations, from individual practice floors to entire studio floors, for many different dance styles. They even offer a kit to allow you to build your own sprung floor of any size! My dream of a portable sprung floor which can be installed atop a concrete floor in a loft apartment is feasible after-all! Upon realizing that the dream of a portable sprung floor which could be laid down in a loft apartment isn’t really at all out of reach, I decided to begin searching for ballet barres and mirrors – two essential pieces of my ideal home dance studio. This website sells fixed and adjustable wall mounted barres, up-to 16′ in length! They also sell free-standing barres. I would definitely prefer an adjustable wall-mounted barre – the idea of being able to tailor the height of the barre to my current flexibility seems fantastic! I’m split on the idea of a double barre… on the one hand, it allows for two heights without adjusting the barre; but, on the other hand, I wonder if the top barre might get in the way during certain stretches on the bottom barre? I’ve only ever used single barres before. The same website also sells portable glassless mirrors of many different shapes and sizes. The best news is that the mirrors can be stacked very compactly for storage and transportation, and their 4×6 mirror only weighs 12 pounds! That means that if I ever needed to disassemble and move my home studio, only the ballet barres would take significant effort to disassemble and pack, and everything should be durable, compact, and light enough to be easily transported anywhere I should decide to move! An 8×5 vertical mirror is $609 – so it would cost roughly $3600 to line one wall of a 30′x30′ dance floor from floor to ceiling. From what I’ve been reading, a 30′x30′ sprung dance floor (900 sqft.) would cost somewhere between $1000-$3000. And a 16′ adjustable double wall-mounted barre is $369. I would use my laptop for playing music – and while it would be nice to have some studio equipment to adjust tempo with, I’m sure that there already exists some freely available software which can adjust tempo just fine – and if there doesn’t, I suppose I could always write some! Update: I found some here and here. The second link, SoundStretch, doesn’t do it live, but it provides a library which I could use to quickly write my own live tempo adjustment software. Other expenses which would perfect my home studio would be a decent stereo system, and a video camera (or two). It would be wonderful to set up the studio so that there would be a couple of angles of HD video which could capture most of the floor space, and would be directly linked to the computer for live recording and viewing purposes. This would allow me to capture and archive tons of video footage of my practice sessions and progress. I could then view the videos after practicing, compare practice sessions and watch my progress. A studio like this would be so ideal for teaching! I could teach private lessons and provide the unique service of offering multi-angle DVD video of all lessons to my students! I think that would be a great teaching tool, and a great way for students to reflect on their lessons and their progress to improve their solo practice! I’m getting even more excited now! A quick estimate looks like somewhere between $2500 to $7000 for the floor, mirrors and barres, depending upon how expensive the floor is, and how much mirror coverage I really need. Another one or two thousand seems reasonable for the stereo system and auto-focusing HD video cameras. Five thousand on the lower side, to ten thousand on the high end seems safe. It might sound like a lot of money to some people, but ten thousand dollars for my own personal dream studio, inside my own apartment, seems like a bargain to me! The most tricky part, I think, would be finding a nice big loft, in a good area, with good natural sunlight, without astronomical rent! Update: Great news for Boston artists looking for live/work studio/loft space! I just stumbled upon restricted artist-only loft housing in Boston through the Artist Space Initiative! Only BRA approved artists are eligible for these studio/loft spaces, which means that these BRA restricted spaces which would otherwise be completely out of a working artist’s price range can actually be within financial reach! Another cool find: Artist Space Finder is a website dedicated to searching for artist work and or live/work spaces in Massachusetts! I was reading some dance forums today, and I happened upon a thread about the (un)importance of the arts. I couldn’t disagree more with those posters commenting that math and science and practical learning are more important than cultivation of the arts and creativity, and luckily I’m not the only one (towards the latter half of the thread, most every post was synonymously advocating the innumerable benefits of the arts!). One of the posters mentioned how the arts foster the kind of creative thinking that is responsible for most of the breakthroughs in all areas of human achievement (even math and science), and I couldn’t agree more – knowing calculus is a great skill, but if you have lost all touch with creativity, then you won’t be very good at solving problems you haven’t been trained to solve. Another poster added a link to a video of a TED talk by Sir Ken Robinson (see below) about the issue of how our modern education hierarchy is engineered to create more of the same type of linear thinkers, at the expense of the creativity and diversity of the human imagination. One of his best examples was of a now world renowned ballet choreographer named Gillian Lynne (Cats, Phantom of the Opera) who as a child was singled out by her teachers as possibly having a learning disability, because she didn’t seem able to sit still all day during her school classes. Sir Ken made the point that if the time had been 2010 instead of 1930, she would likely have been diagnosed with ADHD and prescribed medication – rather than being advised, by a very perceptive counselor, to enroll in dance school. It’s scary to think about such a brilliant individual being prescribed medication to suppress her natural tendencies for creativity and movement, so that she could be made to sit still during classes meant to prepare her for a career in an office somewhere. Very unfortunately, this is likely happening to some brilliant artistic children at this very moment. I certainly don’t take the view that artists shouldn’t be exposed to math and science – I think it’s a good idea for everyone to be exposed to all sorts of education – but I think that if a person has a natural aptitude towards a certain type of learning, then that aptitude should be celebrated, not suppressed in favor of what is deemed to be most practical or desirable. I hope that you find this talk as interesting as I did – and make it past the humor – the talk gets better as it goes on! Also, if you wish to comment, I’d be curious to hear what you think about the relative importance of the arts vis a vis math and science? Do you think that dance should have a place in our modern education system, or that the system would actually be better off if we could replace a few art teachers with more math teachers? On Saturday, May 22nd, I went to dinner with a friend at a beloved Turkish restaurant in Arlington named Pasha. After dinner, with our bellies full, and the night still feeling rather young, my friend and I decided to be adventurous and walk around little, to see if there was anything neat to do in the area. With the help of GPS and Google Maps (what fearless adventurers we were! ), we stumbled upon what we thought, at first, would be a movie theatre. It was off the main road on a side street, and we figured that by the looks of it, they would probably only have one screen. Boy, were we in for a surprise… Upon walking into the lobby, we found a crowd of people socializing, and quickly realized that it wasn’t a movie theatre at all! It was an actual theatre, the kind with a stage! We found out that the main show of the night was a tap performance, in honor of International Tap Dance Day, and that we had arrived during the intermission. The box office was closed, but a nice lady helped us to find a man who worked there, and he told us that they’d be happy to sell us tickets for the second half! The normal admission was $25 per seat, but he was very kind and only charged us $10 each. We had 3rd row seats on the left side of the stage (these seats were apparently reserved and never claimed), and it was a great view to watch the performance from! Neither my friend nor I had seen a live tap performance before, so it was an exciting event to have stumbled upon. It was a really neat show! It turned out that the group was sort of an experimental jazz group, with a vocalist, pianist, cellist, and with the tap dancer serving primarily as percussion, rather than as a visual experience for the audience. In fact, the audience was encouraged to close their eyes during the performance, to see how that affected their perception of the music, and the role of the tap performer in being a part of the music. So, once again, we were surprised, because we bought tickets expecting to see a tap performance, and we quickly found that we were there primarily (though not exclusively) to hear one! It was very, very different, and neat! The tap dancer, Heather Cornell, had several different pairs of tap shoes, each made from different materials, and intended for different purposes. She even had one custom made pair, which had four different materials, between the the two shoes – this allowed her to achieve different sounds not only by the way she performed her tapping actions, but by the parts of each shoe that she tapped with, giving her a greater range of expression. She also varied the surfaces/materials that she tapped on. One area seemed to resemble sand paper, while another was wood, etc. It was not at all what I had expected to see in a tap performance – it was delightfully different! Also, having taken beginner tap myself, it was very easy to appreciate her skill – it’s difficult enough to tap dance… using tap as a more general musical instrument has really got to be an immense challenge! The Moroccan vocalist, Malika Zarra, had a very unique voice and vocal style – she didn’t really sing lyrics so much as use her voice as yet another instrument, and during the rare times when she did sing actual lyrics, they seemed to mostly be in Arabic. Her voice alternated between mesmerizing and emotionally piercing, and occasionally managed to impart both seemingly contradictory feelings at the same time. So already, two pieces of the ensemble, the tap dancer, and the vocalist, were being involved in atypical manners. We quickly learned that the pianist, Andy Milne, wasn’t about to be typical either – he used various things, not all of which I could quite discern, to augment the way that his piano played it’s music. For one, he seemed to use a kind of brush against the strings at times, when he wanted to create more dark and eerie sounds. I think he also put some kind of cushion between the hammers and the strings at other points in time, to mellow out the impact of the keys he was playing. Last but most certainly not least, was the cellist, Dana Leong. He was playing a cello which was entirely missing it’s wooden box! It was only the frame, and the strings! At first, I was a little bit confused by how it was able to actually produce music. Then I quickly realized that there were wires attached to it, and that he was using his feet to manipulate a computer, controlling the synthesizer being used by this electric cello! At the very bottom of this post, you’ll find a picture of one of his CDs, which I purchased after the performance. I am absolutely in love with his music, and I have been playing the CD to death ever since! You can also click the small play button to hear a preview of one of my favorite songs from the CD. I’ve also provided links to his website, and to ways to purchase his music, because I just can’t speak highly enough of it! I felt that all of the performers were amazing, but I only had enough old-fashioned cash left to buy one of their CDs, and I was most impressed by his solos on the electric cello (one was even reminiscent of Jimi Hendrix’s electric guitar rendition of the Star Spangled Banner), so his music was my first choice. Overall, it was a really pleasant surprise, and a very fun night! Synesthesia is a great show to just feel, with your eyes closed, fun as it is to watch the details of how they’re augmenting the musical experience with your eyes open. I recommend that if you ever have the chance to see any of these performers (or the whole group) live, you shouldn’t hesitate one bit! The Regent Theatre is also a very neat establishment, and now that I know it exists, I plan to see more shows there in the future… It’s very nice to stumble upon small independent venues of the arts, and this one is especially neat, since I had thought small theatres like this had all but died off. I’m wholeheartedly glad to see that they haven’t! 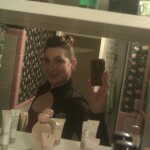 As I was writing the last post about Lyrical, I was also talking to a new friend, who also dances Standard, on Facebook. We were talking about practicing, and I was recounting one of the random ways I practice standard when I have the floor all to myself for an hour before lyrical on Fridays. After explaining it to her, it occurred to me that what I was doing, without consciously being aware of it, was really like a fusion between standard and lyrical! Sort of like lyrical using standard technique, instead of ballet/modern/jazz/tap technique. Basically, I wear my ballet slippers, and I put on my Bluetooth earphones (connected to my cell phone, which has 16gb of dance music!! :D), then I pick a dance (Waltz, Tango, Foxtrot, Viennese Waltz, Quickstep), and I cycle through songs until I find one that I have an emotional connection to — one that, for me, characterizes the dance, and touches me – a song that makes me feel and want to move to the music. Then, I bring my arms up into a solo dance frame (as if I had an invisible partner), and I just go. I dance to the music, whatever my body feels. I don’t have a routine in mind, and I’m only partially consciously aware of what I’m doing – mostly, my muscle memory is just working together with the emotions and feelings I’m getting from the music, and things just happen. Sometimes goofy things happen (good thing I’m alone on the floor! ), and sometimes I run out of space up against a wall and have to restart, but other times, a little bit of magic happens, and various open steps that I’ve danced here and there flow out of me and into each other like physical poetry. Sometimes I don’t even know what I’m doing until I’ve done it, and sometimes I’m not even sure I could repeat what I just did if I tried to, but when I’m in this zone – loaning my body to the music and my emotions, all my fears and doubts and self criticisms dissipate, and I just feel and dance! Stats: 23 queries. 0.270 seconds. Valid XHTML, Valid CSS, XFN. "Floral Belle" theme by Nicki Faulk.